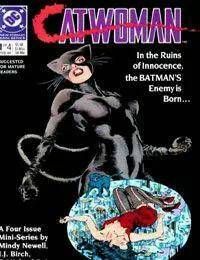 At the beginning of the story a young prostitute (Selina Kyle) is shown half naked and beaten severely. An elderly nun named Sister Elizabeth then comes to the alley. She moves away a cat saying she will not feed it like her fellow nun, then is horrified when she sees Selina. Sister Elizabeth calls an ambulance and the Gotham Police who all ask the nuns if they know her name, but none do. As the police and paramedics leave a nun arrives, while Selina leaves carrying a cat. Sister Elizabeth asks her fellow nun (Maggie Kyle) to put the cat away, but the visibly sad Sister Magdalene says she always had cats at home. Sister Elizabeth then asks Maggie if she has seen her sister yet, but Magdalene says no (unaware that her sister was the prostitute).